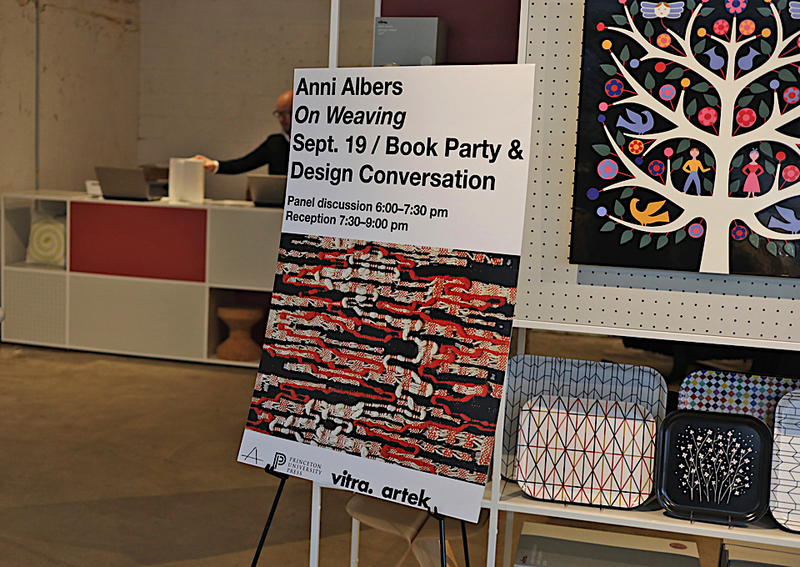 During the second edition of the New York Textile Month the Anni Albers Foundation hosted a launch party and design conversation in occasion of the launch of the new, expanded, full-color edition of Anni Albers’s “On Weaving” book published in collaboration with the Princeton University Press. 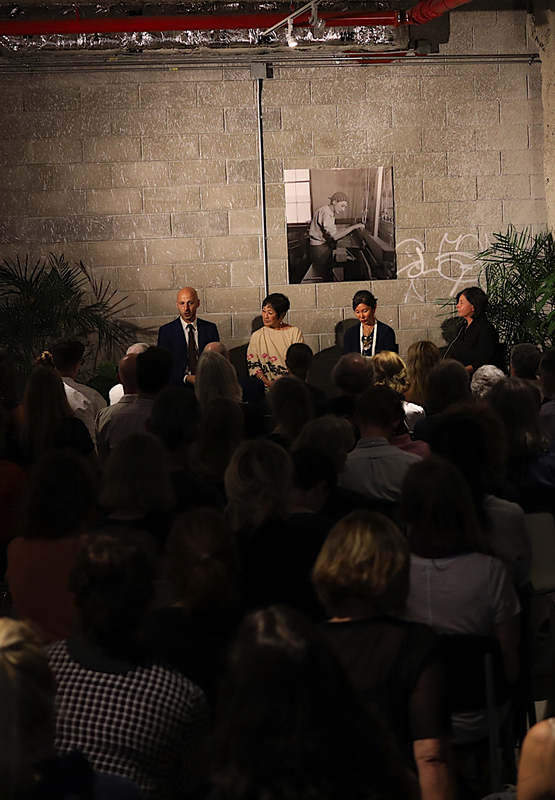 The conversation was moderated by Brenda Danilowitz, chief curator of The Josef and Anni Albers Foundation and the panelists were Glenn Adamson, curator and theorist across the fields of design, craft and contemporary art; Christina Kim, artist, textile designer and founder of the Los Angeles based clothing brand Dosa; and Billie Tsien, architect and partner at Tod Williams Billie Tsien Architects. 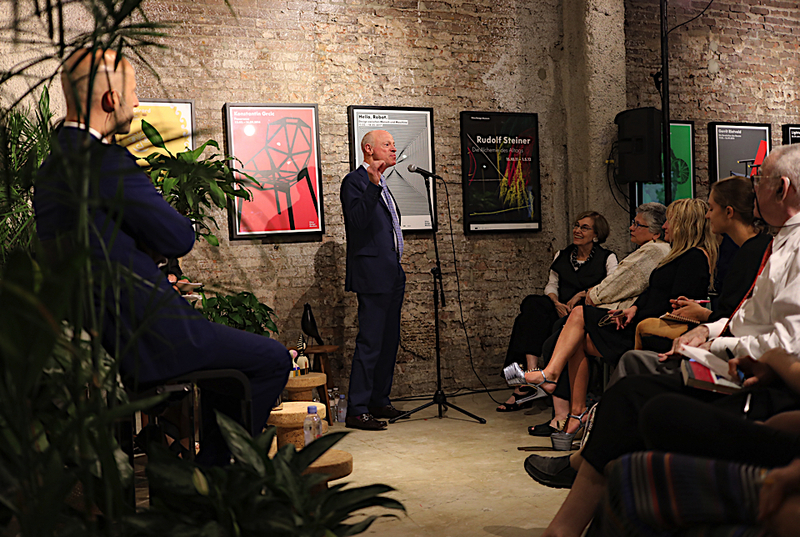 A reception followed the discussion, allowing all participants a chance to speak with the panelists and the Josef and Anni Albers Foundation members to discover “the event of a thread” in Anni Albers’s own words. 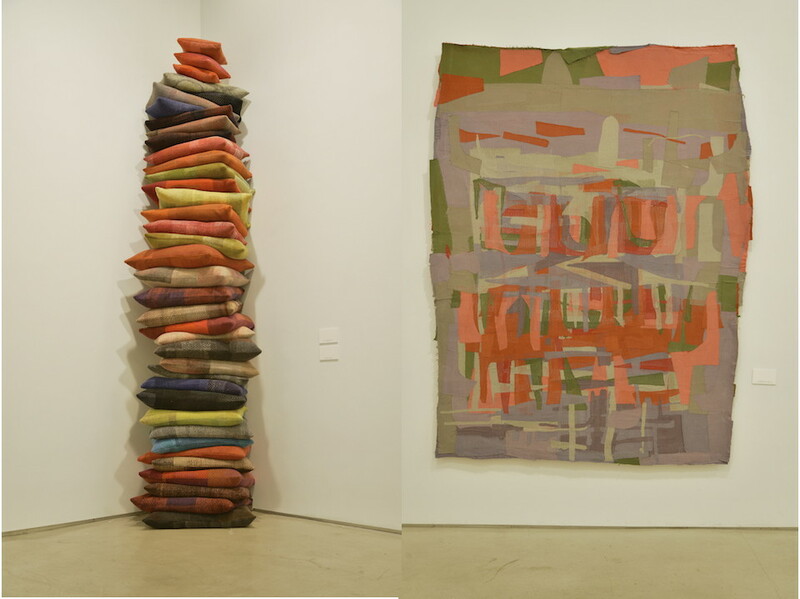 Anni Albers was one of the 20th century’s most innovative and influential textile artists, with her subtly abstract works of art, bold wall hangings, articulated architectural fabrics and experimental jewelry and prints. 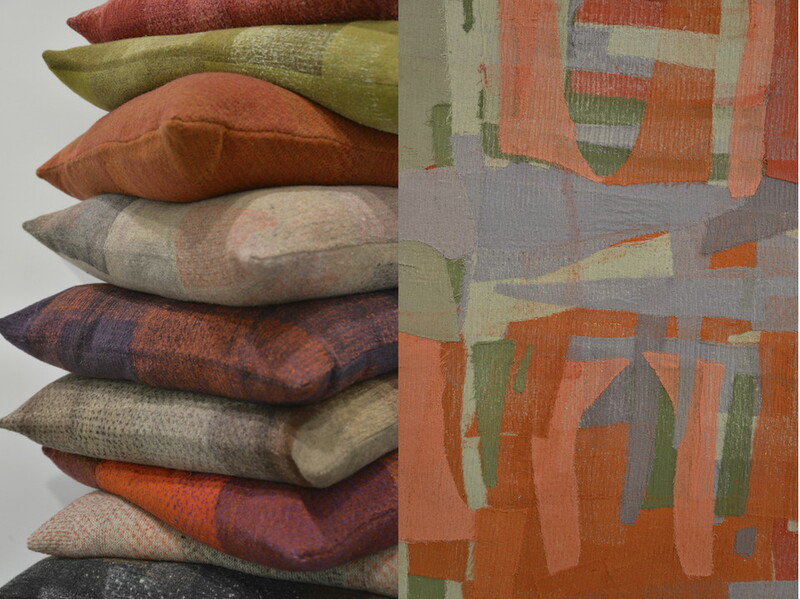 On Weaving collects her wide knowledge and observations on the art of weaving and its implications in modern design. 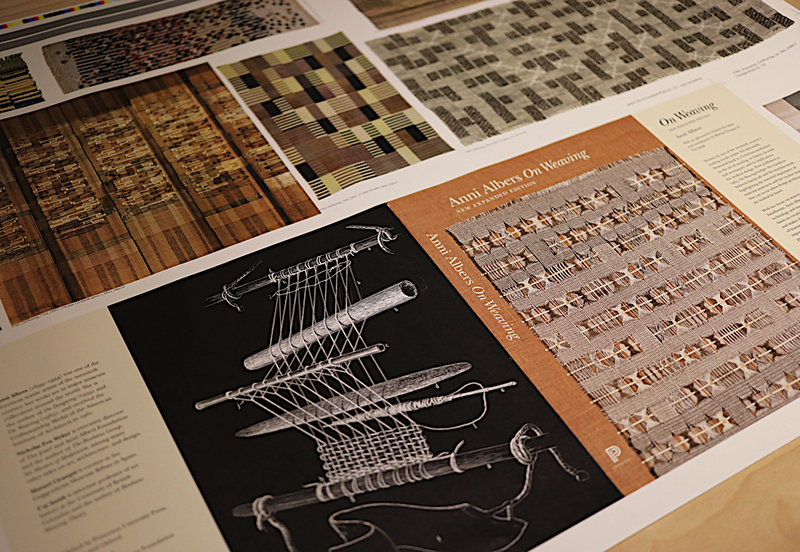 The second, newly published edition of “On Weaving” features renewed photography and outstanding full-color illustrations, keeping the original book's design intact while completing it with new essays by Manuel Cirauqui, T'ai Smith, and Nicholas Fox Weber. 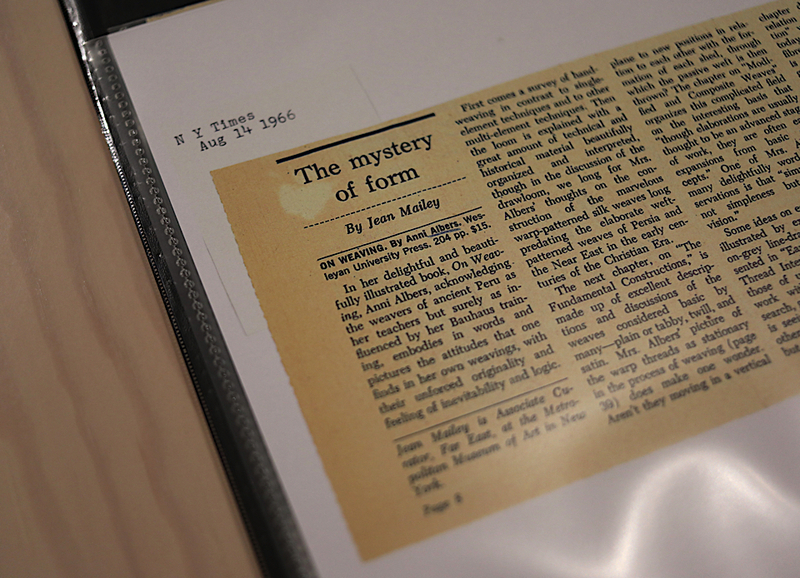 This updated version of the pivotal 1965 book confirms the fact that “there was only one way to present her text, and that is her way”, as Brenda Danilowiz affirms during the conversation in front of an audience composed by designers, architects, weavers, artists, curators, admirers and friends. It was impossible for the panelists not to mention how intentional and inevitable every word feels, how well the strong personality of Anni is portrayed by her words, how the rhythm of her writing as well seems to mimic the shuttle going back and forth on the loom. During the conversation the speakers gracefully celebrated the work and research of Anni Albers talking about the importance of slowness, the relevant role of tactility, the art of creation in weaving, writing and architecture, the meaning of past and present technologies and the idea of individuality for a collective vision. 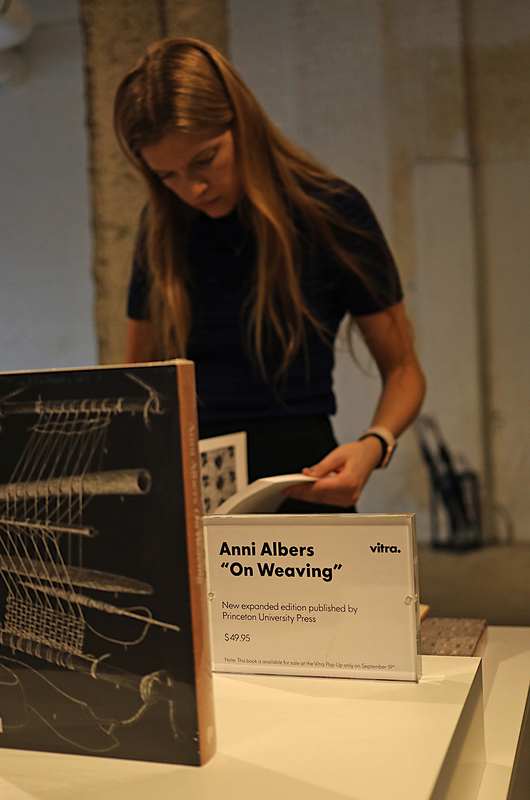 The entire event was a testimony of the enduring legacy of Anni Albers, whose work and ideas continue to inform and inspire even after 60 years from its first publication, confirming the importance of keeping the conversation about textiles and weaving open. 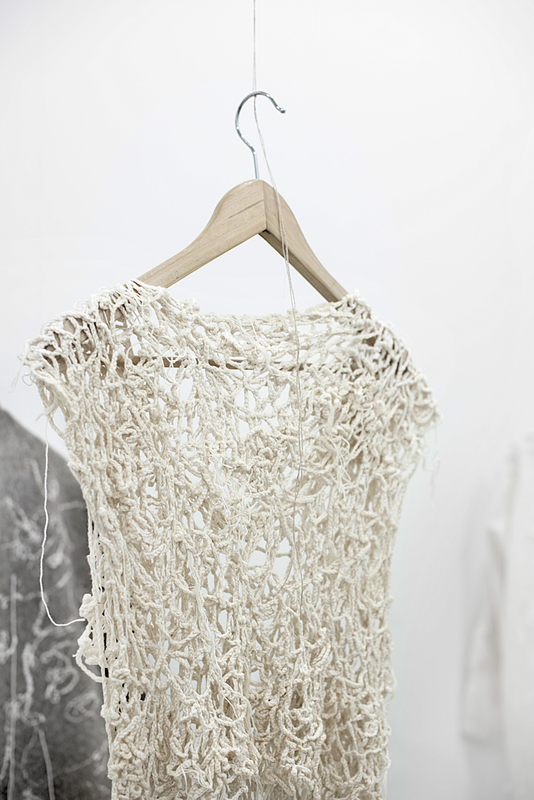 Manonik’s concert starts from the yarn, made in cotton and wool, personally gathered by the artist from Georgia, North Carolina and Hudson. The yarn alone takes one year to make. The process continues on the loom, with three-dimensional pattern weaving, traditional hand weaving and embroidery, manual machine-knitting, hand spinning, machine sewing, felting, and natural dyeing. 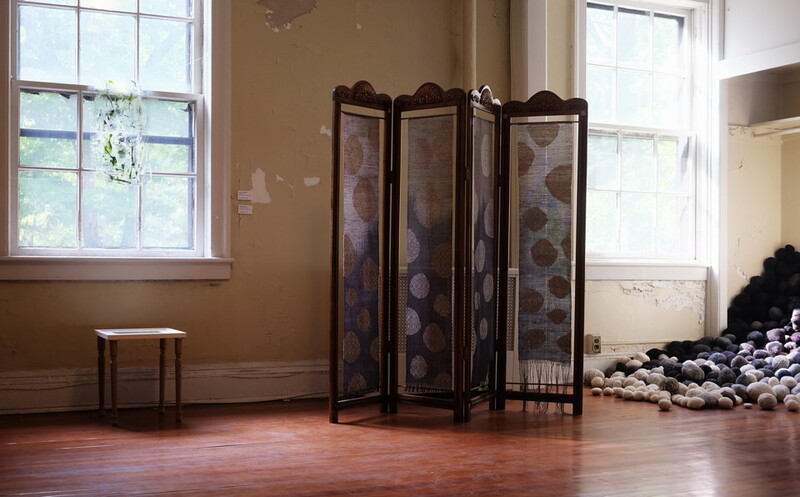 The result of the process is perfectly shaped panels that the artist assembles together with very few seamless stitches and embellishes with recycled pieces of fabric and knit. He strives to create a closed, efficient system to leave as little waste as possible. He is in concert with the “local” landscape and ecology, because of his approach to materials, with the “historicity” in our economic development and, during the exhibition, with Dave Nelson’s music. 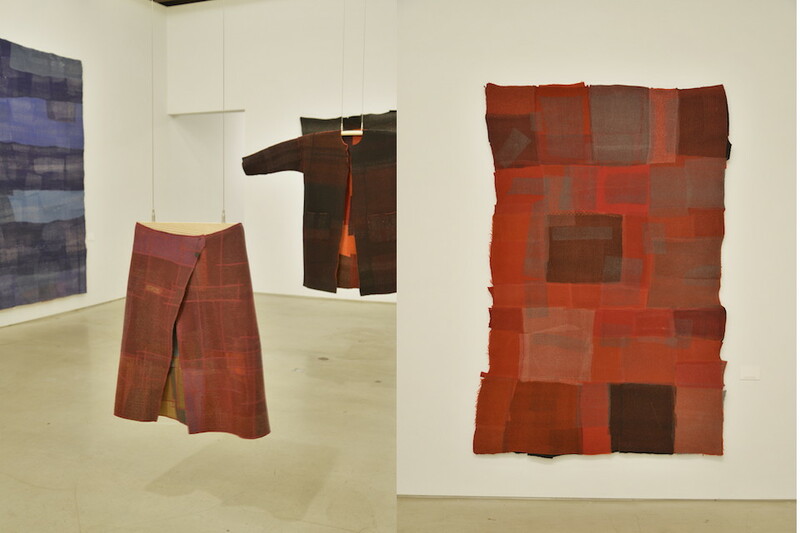 His pieces are the manifesto of a new attitude that wants to redefine the use of clothes, the demonstration of a deep desire to go back to artisanal practices that involve time and the deepest dedication, in order to move past the burdens of capitalism and globalisation. In one of his pieces, he affirms “I have a dream that one day the dream is no longer but reality”. Presented by ARToRIAL _ HOTEL PARTICULIER and courted by Frederique Thiollet and Anna Mista, the installation of the pieces of Katherine Mavridis, combined with the photography of Ellinor Stigle, takes inspiration from the personal fitting made by the designer with the late Dame Zaha Hadid, whose measurements appear in the title. 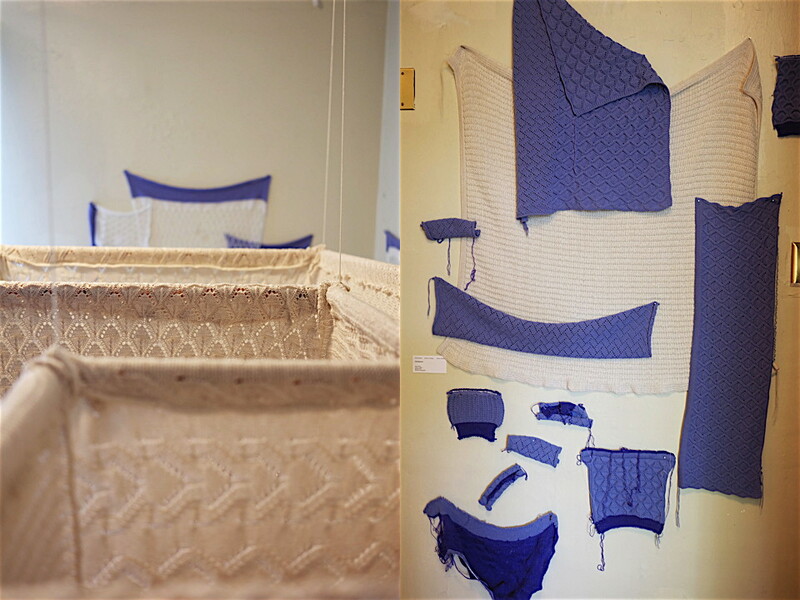 Katherine Mavridis garments were born in the degree zero of fashion: from the yarn. 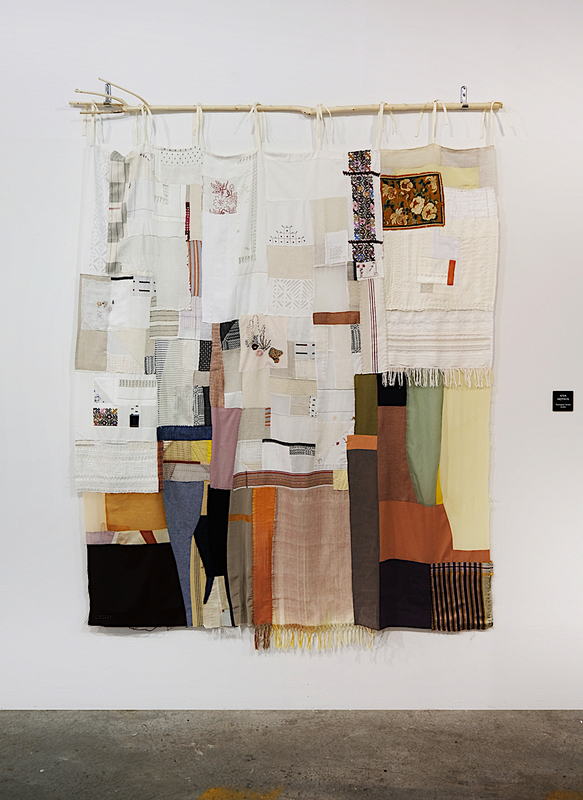 At first, when she started working with single yarns to transform them into fabric, she perceived the whole process of weaving, cutting and assembling as unnatural. 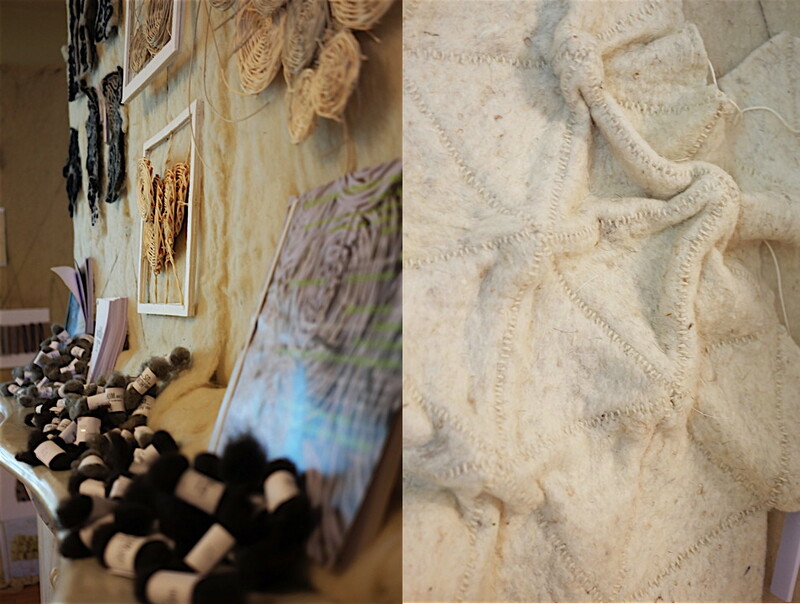 Spontaneously, she started coiling the yarn in mounds of rope that would “naturally grow” in circular shapes. Born in such an instinctive way, these garments are more the materialisation of a feeling rather than a concrete object. 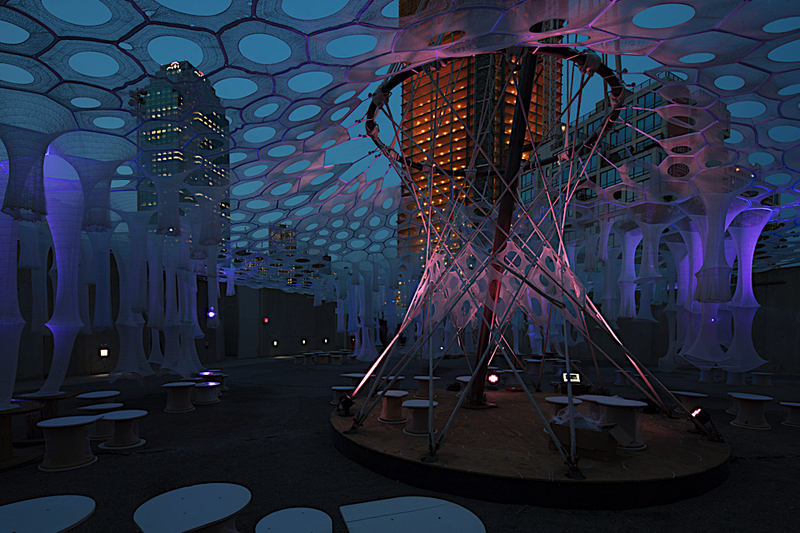 These abstract, three-dimensional structures, can exist both with and without the body. They are form and negative form, matter and negative matter. For this reason they also belong to the void. 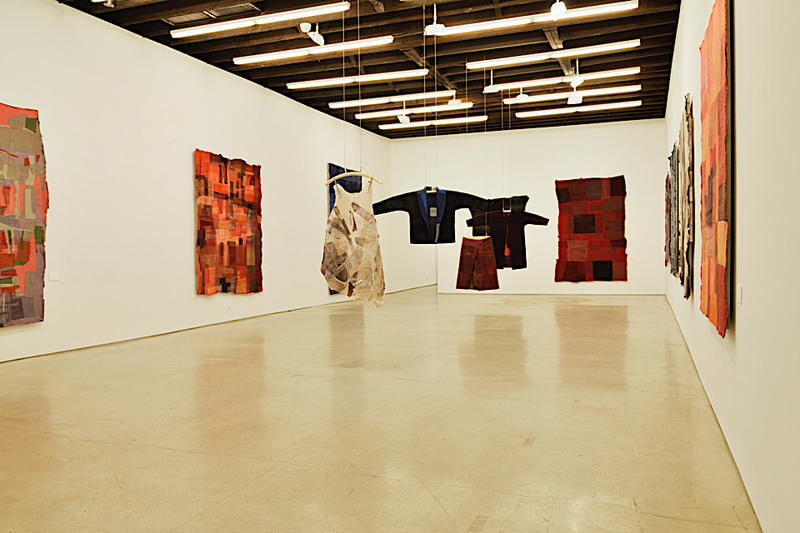 Garments are essentially an ensemble of tubes. 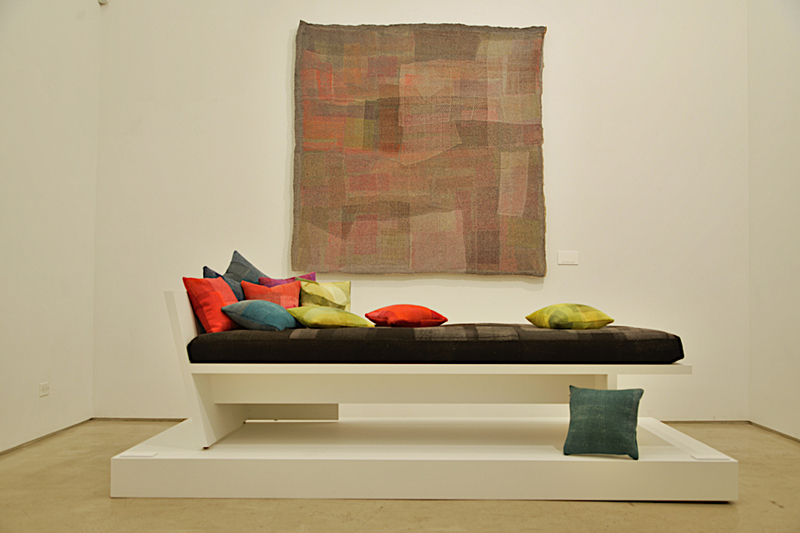 The coiled shapes form sculptural elements whose negative space is the space of the body. 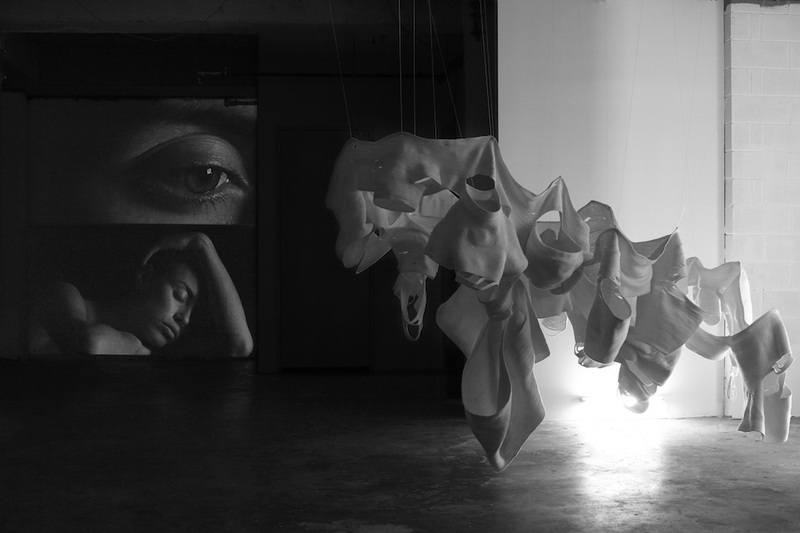 In lieu of the exhibition Mavridi’s garments coexist with Ellinor Stigle’s Nucleus video installation. As the relationship between space and negative space in Mavridi’s pieces, light and darkness co-depend in Stigle’s work as the source of every shape. The persistent sound that follows the images is life’s very own: heartbeat. 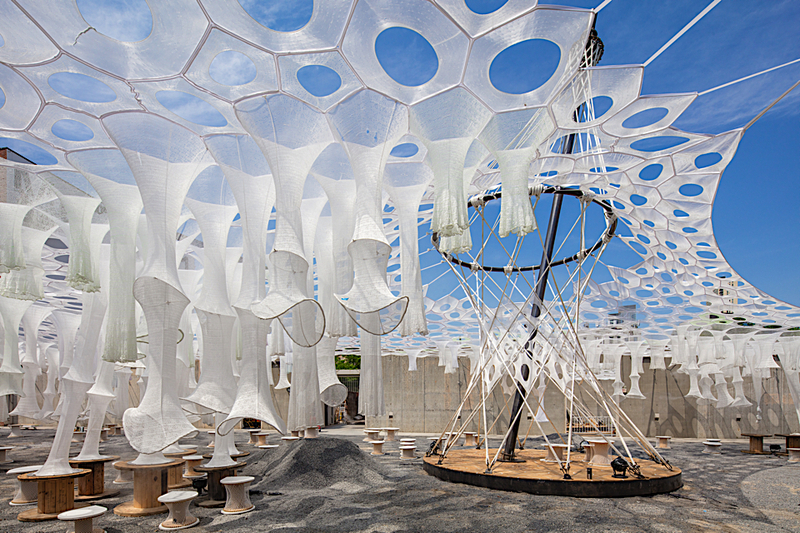 Born from the union between biology, material science, mathematics, engineering and textile research, Jenny Sabin Studio’s interactive installation Lumen is composed by over one million yards of digitally knitted fibre forming 250 hanging tubular structures as well as 100 robotically woven recycled spool stools and a misting system that detects visitors’ proximity. 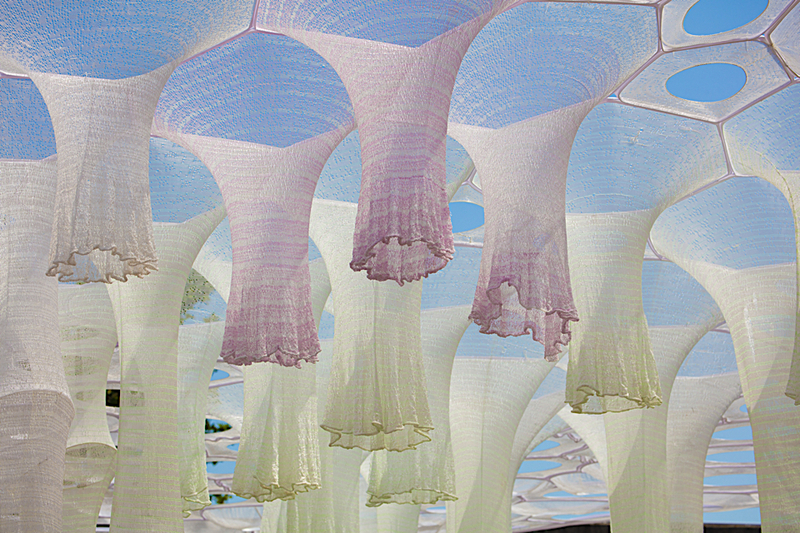 Inspired by an idea of lightness, playfulness and interaction, its architecture is socially and environmentally responsive and morphs along the course of the day: the structures are able to feel and adapt to density of bodies, temperature and sunlight, and the textiles, which display delicate hues by day, start glowing at sundown. 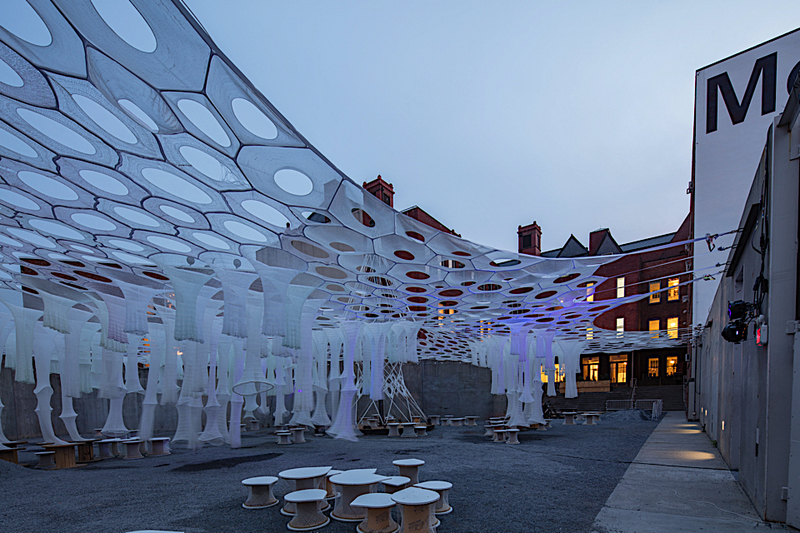 These unforeseen features have made Lumen installation in MoMA PS1’s courtyard the perfect setting for the 20th season of Warm Up, the museum pioneering outdoor music series and one of the most interesting exhibitions held during the second edition of the New York Textile Month. 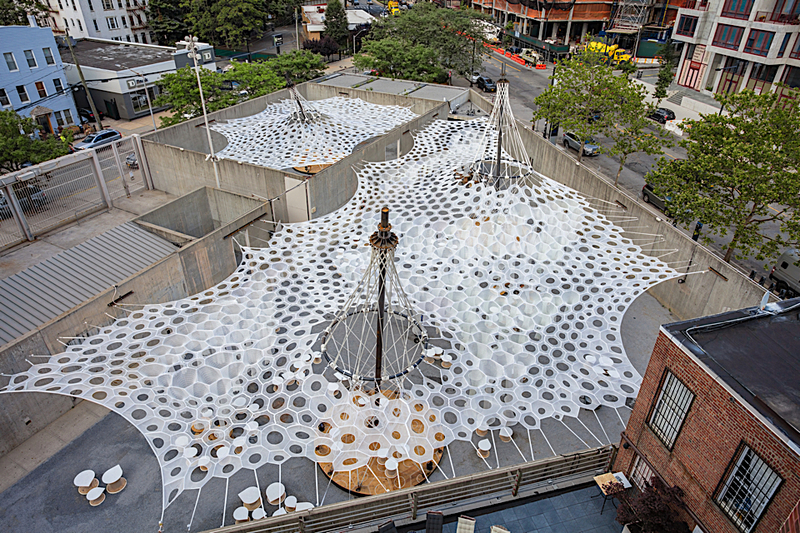 The project is also the winner of The Museum of Modern Art and MoMA PS1’s annual Young Architects Program, that in its 18th edition has offered emerging architectural talent the opportunity to present innovative design projects based on the challenge of creating a temporary outdoor installation that could provide shade, seating space and water and would at the same time address environmental issues being sustainable and recyclable. The elegant and soft-spoken woman is a dynamo disguised in a slim and modernist body. With straight white hair, black masculine glasses and minimalist clothes, she has no age, just grace. Eileen Fisher founded and manages an all-American company that dresses civilized women of all ages and sizes in easy-to-wear, voluminous basics that slit from the shoulder and layer effortlessly. 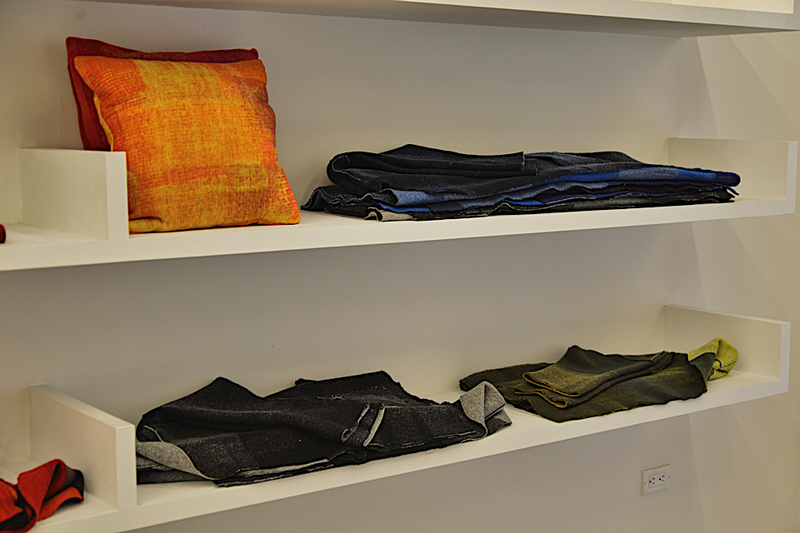 Fisher understands that clothes need to be sustainable; her company uses organic cottons and partly manufactures in America, setting higher sustainability goals each year. 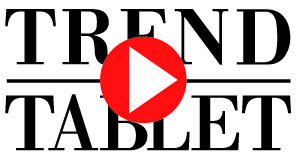 Eileen Fisher’s faithful fashions have generated a steady stream of income that has been invested in her company to give back to society with a brand called Eileen Fisher Renew. Now, she pushes her ideas a step further with the recycling of her own goods. 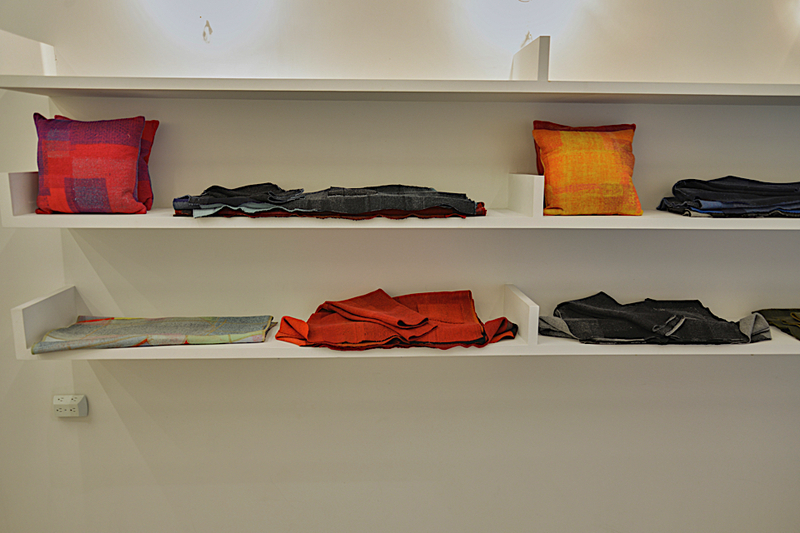 Clients can give back their old Eileen Fisher garments and get five dollars to spend on something new, creating a rather amazing return of merchandise to their mill in Irvington, north of New York City. The secondhand pieces are cleaned and checked for flaws or stains, and all perfect items that are still in shape are put back on the market as vintage pieces. 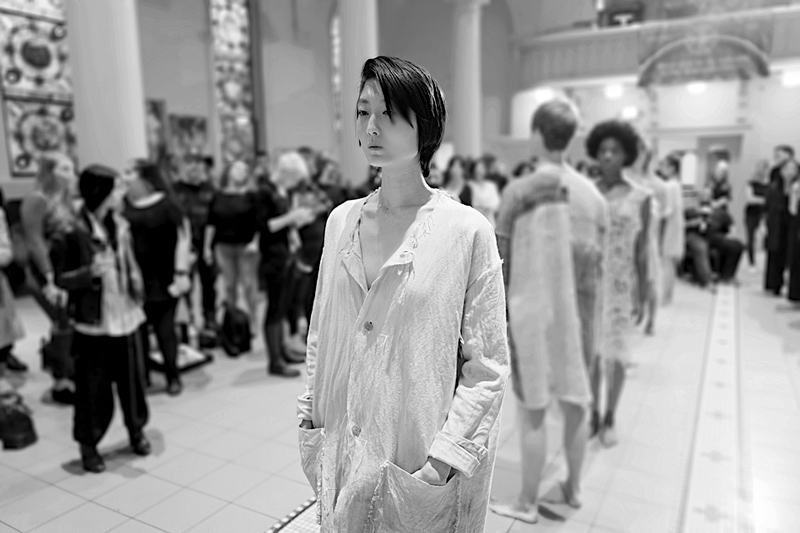 The designers from the house like to browse and study the historical pieces for new clues on sustainable styling and for insight into the brand’s ethos. 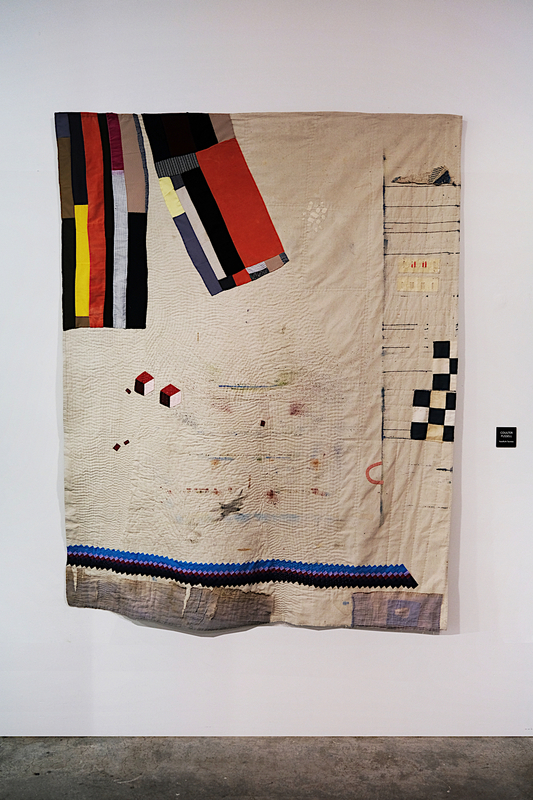 Clothes that are damaged beyond mending are carefully selected according to fiber and colour, ready to be remade and reinvented, and even re-coloured at times. 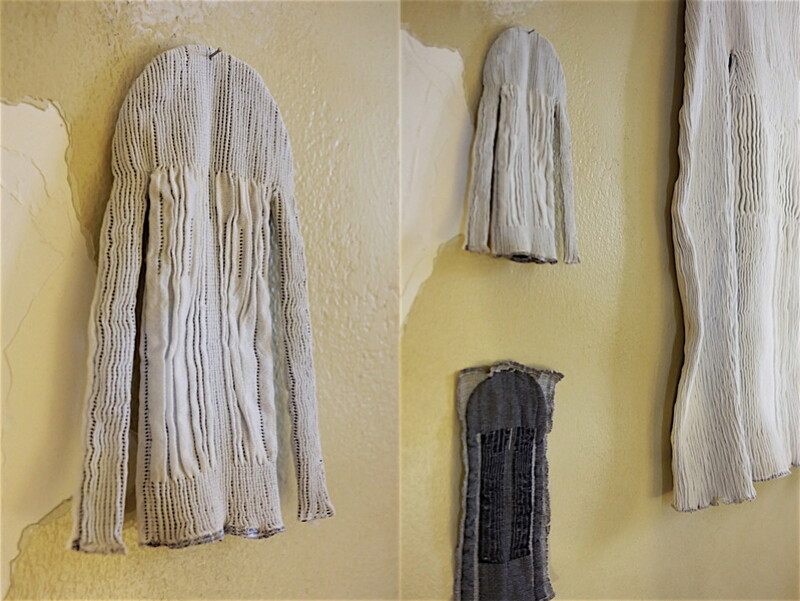 The garments that are deconstructed and redesigned from scratch and scraps by Carmen Gama look amazingly young and design-driven. 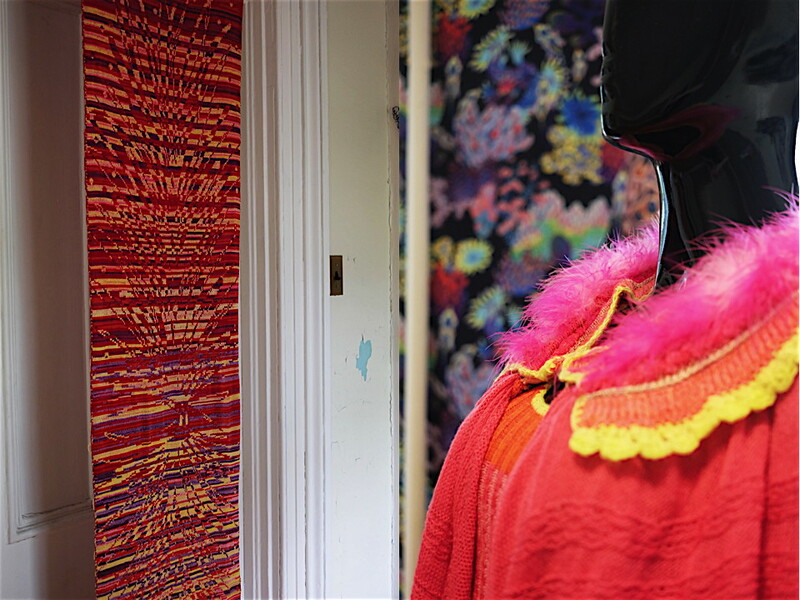 Combining different textiles in one style, they act like fashion student experiments; a far step from the regular collection, somehow showing that the business of recycling can set companies free from their own commercial rules, leaving space for innovation and creation. Ultimately, these new garments might become such a success that they will influence the permanent collection, making the circle of recycling go back on its own track, recharging creativity from within, and giving confidence and ownership to the brand as never before. 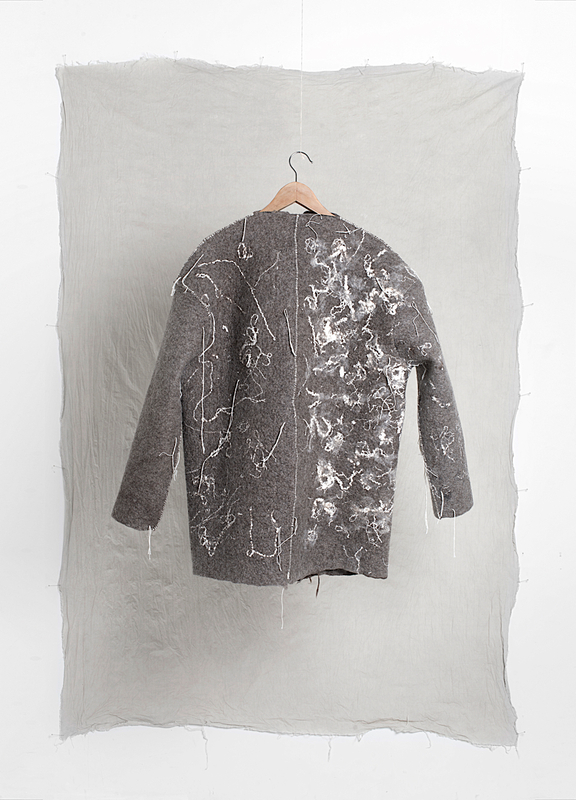 Creativity becomes even more palpable when old cashmere sweaters in all sizes and states of discomposure are carefully selected by colour families, layered in a composition and felted into new blankets and carpets, sometimes even coats. Dedicated workers have trained their gifted fingers to listen to the materials at hand and can now detect the composition of a discarded garment by touch. 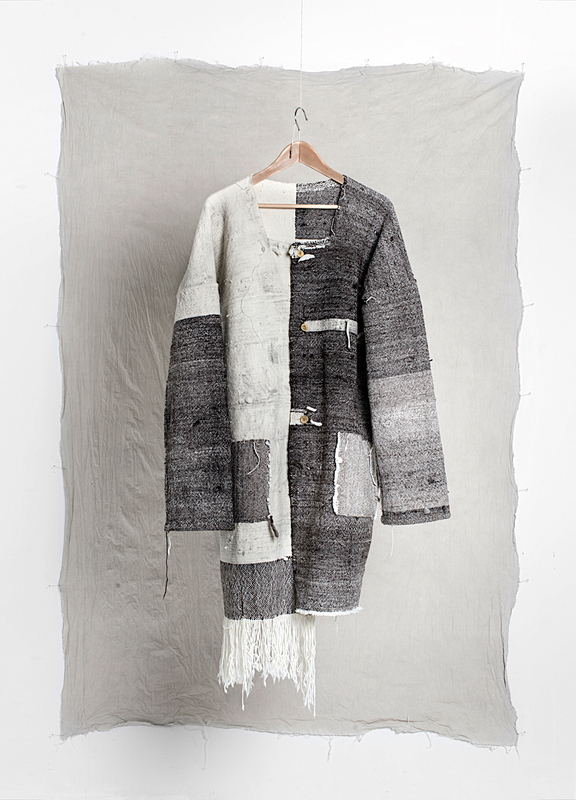 Sigi Ahl, creative director (and artist) of the project together with Carolina Bedoya as designer, manipulate and layer the pieces of knitwear into blankets of matter that elevate the material to another level. 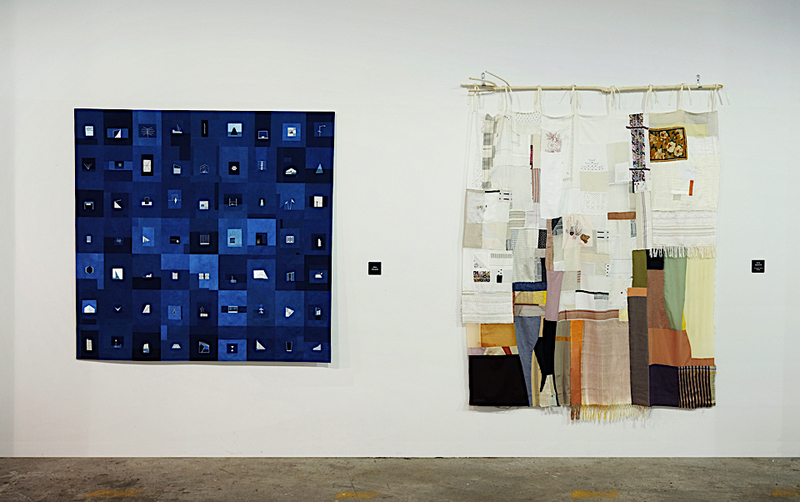 These unique artistic pieces come close to art, but they are an intimate form of art to cuddle and care for. 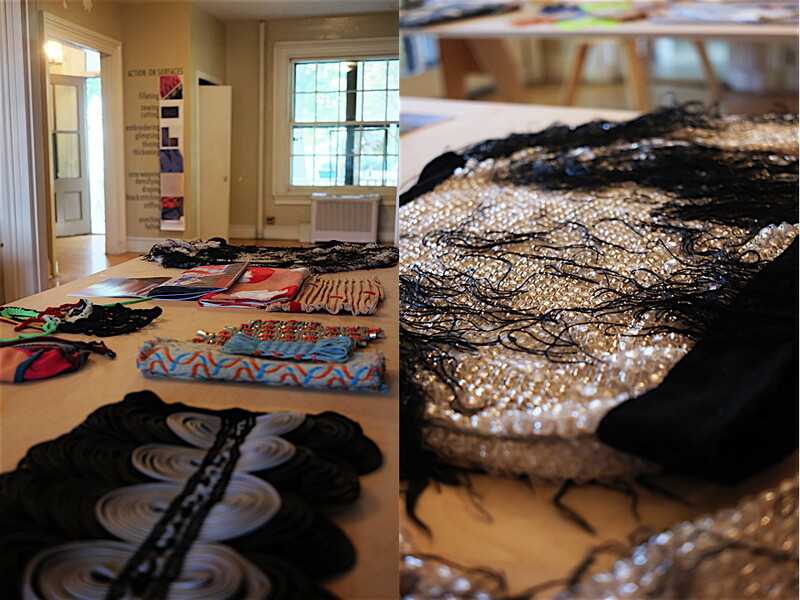 This innovative use of waste is able to radically transform the mission of a brand and change its perspective. Thus, a lifestyle brand is found in the debris of overconsumption. 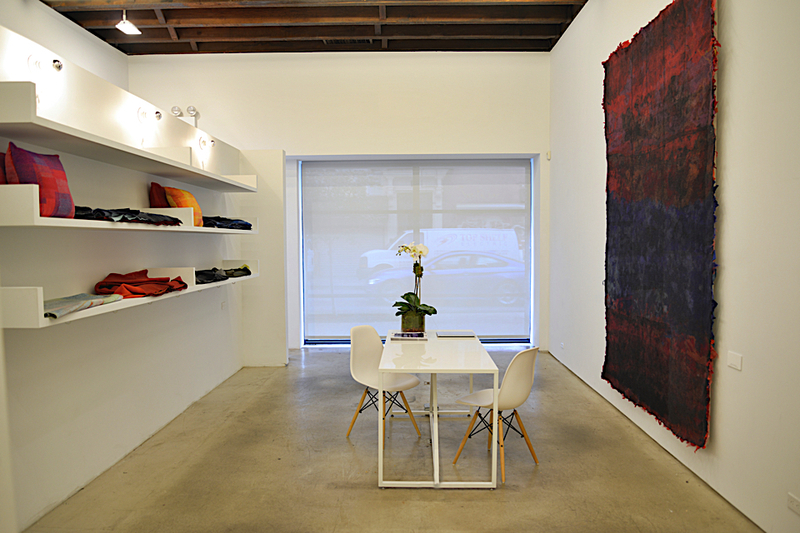 Establishing Eileen Fisher Renew as a high-end endeavor gives further proof that the effects of recycling as a philosophy and as a practice are becoming a new school of thought. When waste becomes wealth and culture, the circle has come around twice, empowering new ventures, and gifting the world with amazing beauty. 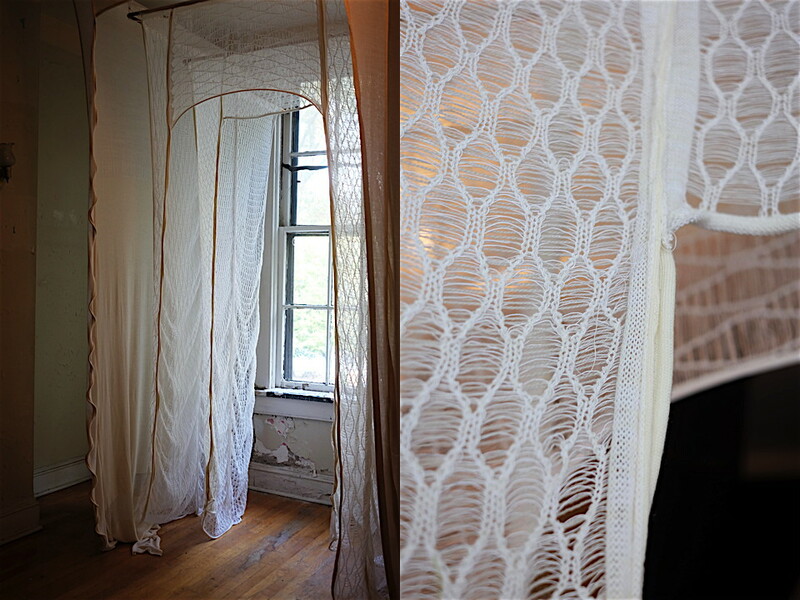 A pop-up mini factory illustrating Eileen Fisher Renew took place at The Invisible Dog Art Center, Brooklyn during NYTM as well as a gallery installation of the result in a gallery located in the Bowery. TALENT! 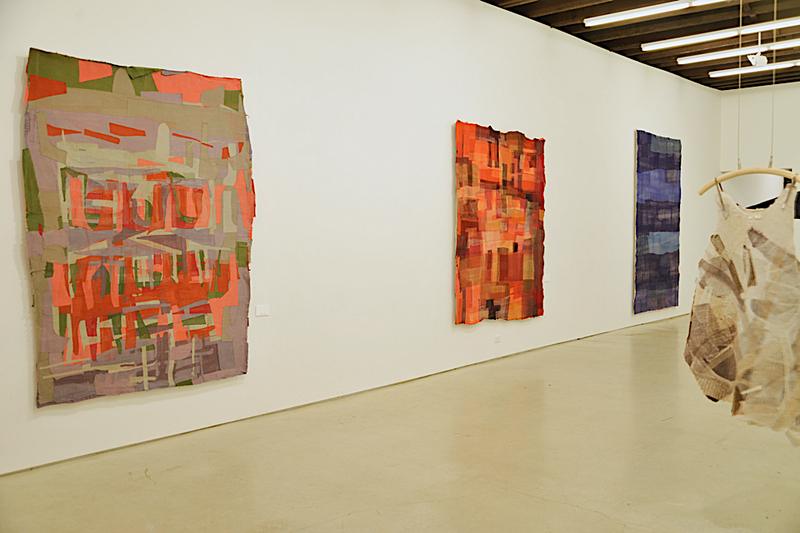 An ongoing exhibition series featuring graduate works from the world’s leading art and design schools. 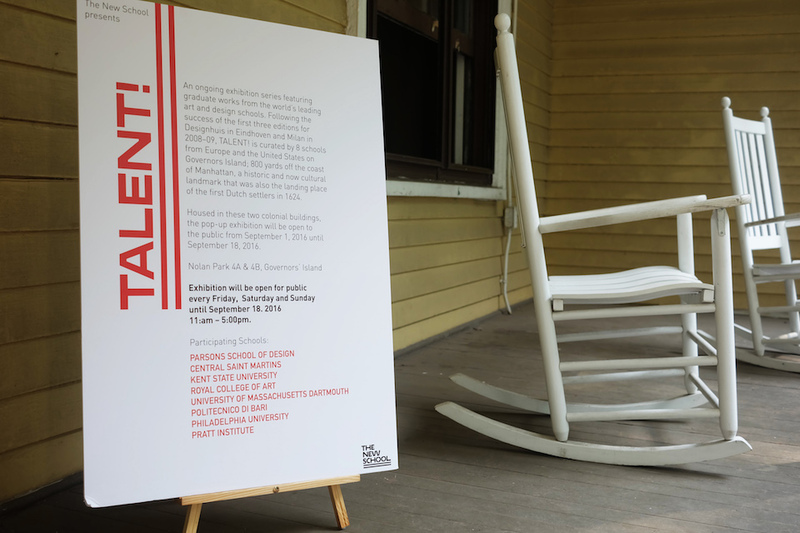 Following the success of the first three editions for Designhuis in Eindhoven and Milan in 2008–09, TALENT! 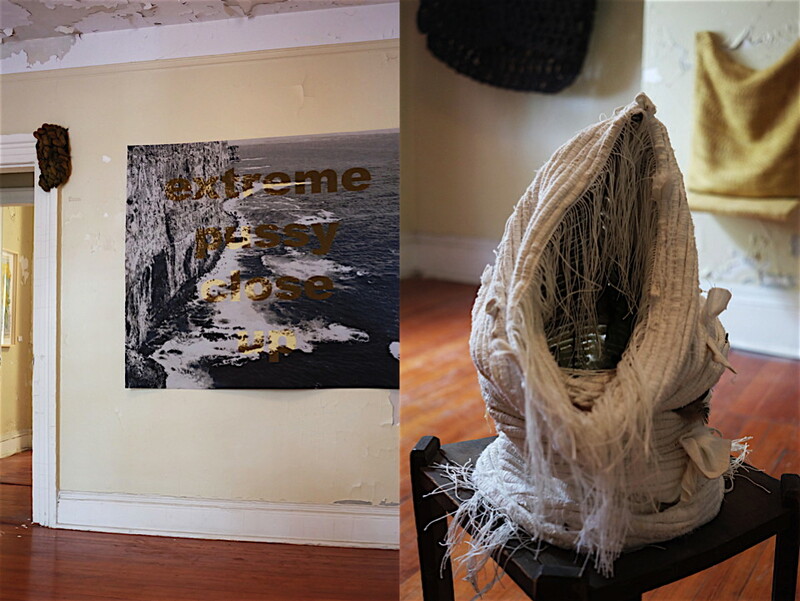 was curated by 8 schools from Europe and the United States on Governors Island; 800 yards off the coast of Manhattan, a historic and now cultural landmark that was also the landing place of the first Dutch settlers in 1624. 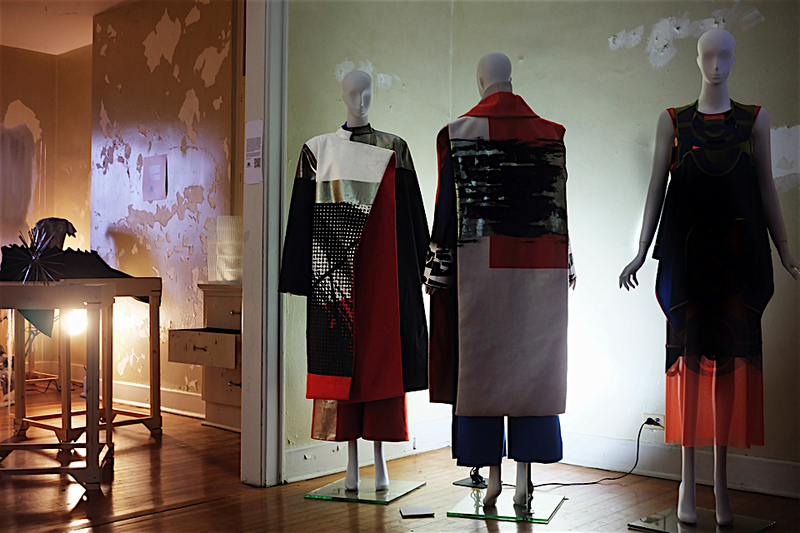 Housed in two colonial buildings, the pop-up exhibition was open to the public from September 1, 2016 until September 18, 2016. 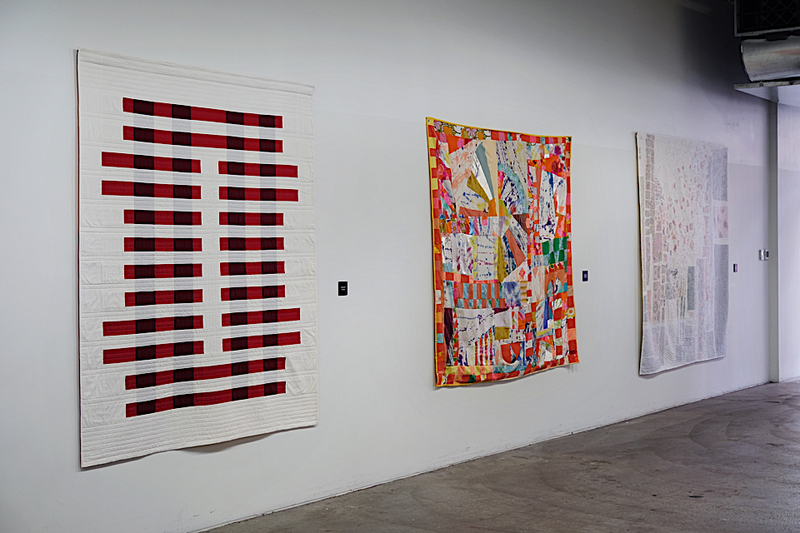 New York Textile Month is a New School and Cooper Hewitt Design Museum initiative celebrating global textile creativity and innovation in events held throughout New York City. 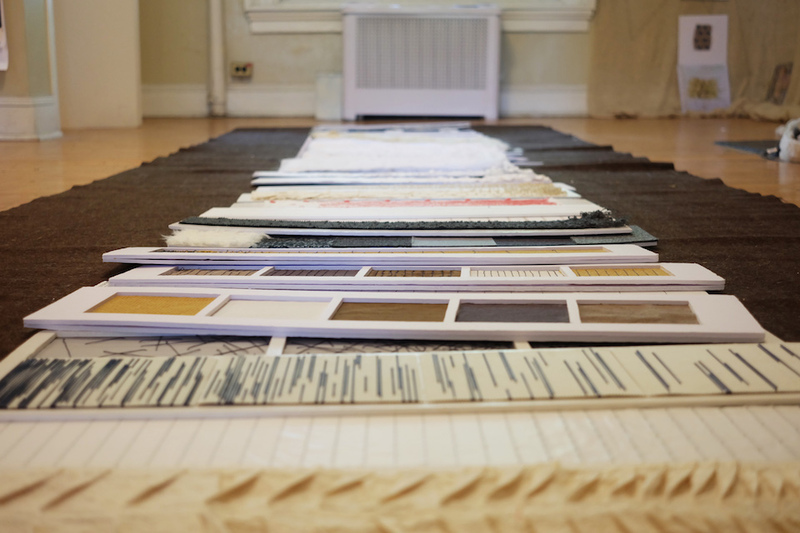 The variety of textile approach within the different institutes showcased a comprehensive reflection on the current status quo of textile education. 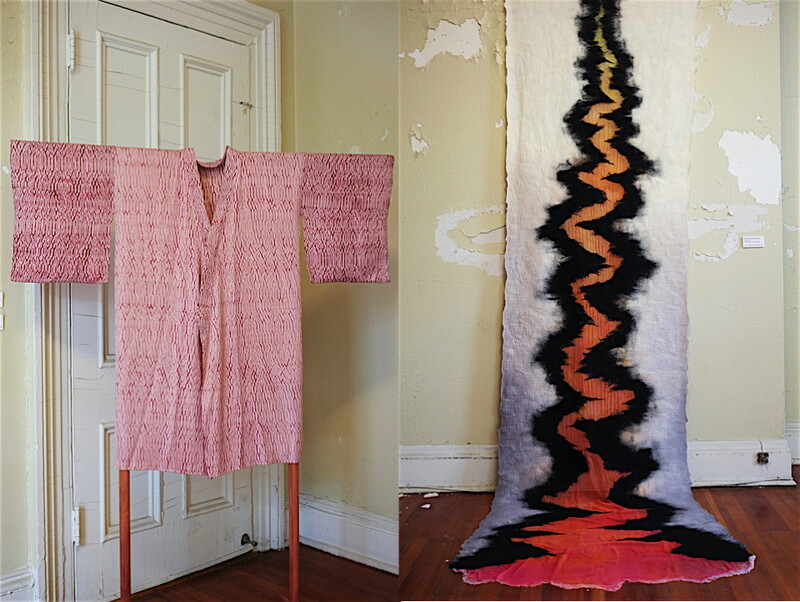 A new MFA in Textiles created by Lidewij Edelkoort for the Parsons school of Design is due to be launched in September 2017, and therefore the hosting university decided to exhibit graduate work from the Fashion’s Bachelor department this time. 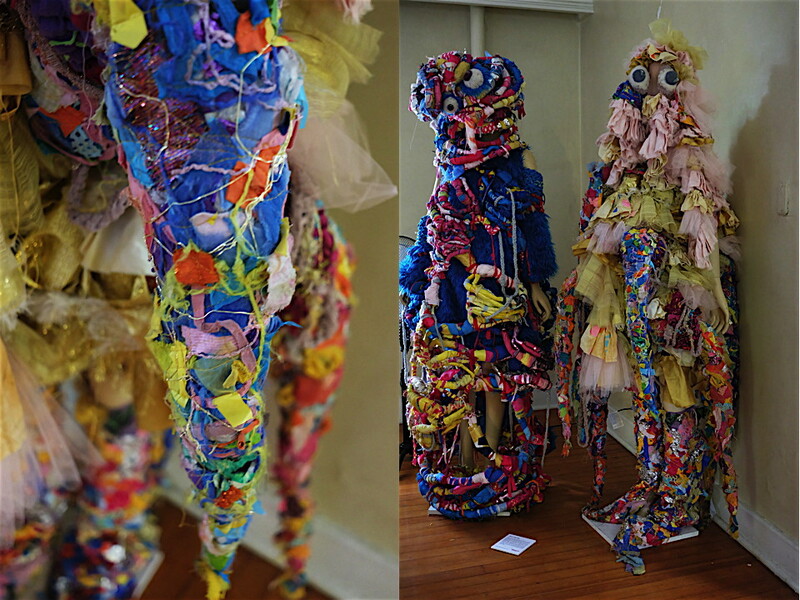 Students highlighted different techniques in using textiles for their silhouettes; from the Kookerville creatures by Lexy Ho-Tai who invented humorous monsters, simply to make people smile, constructed of found and recycled materials to the interactive designs by Kailu Guan who developed a collection of 6 looks and an accompanied smartphone app, which together display sentiments that are unique to her experiences. 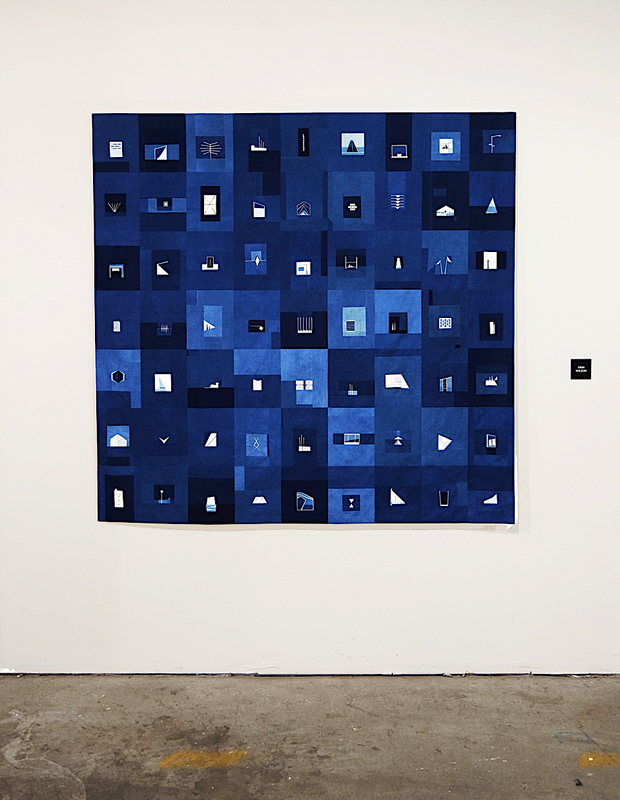 She developed screen-printing techniques that not only speak to the aesthetic, but are also optimised to perform as recognisable information. 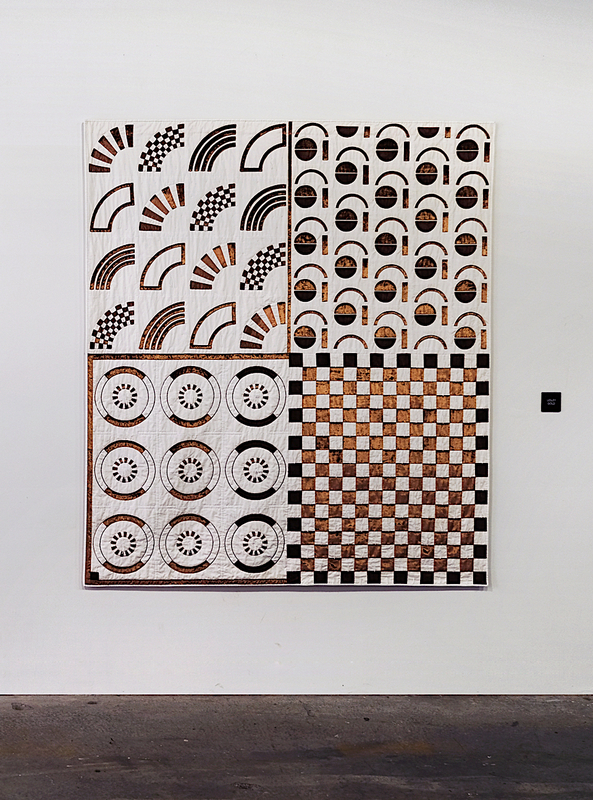 The Bachelor Industrial Design program at the Polytechnic of Bari investigated the know how of mediterranean heritage, intersecting innovation with tradition. 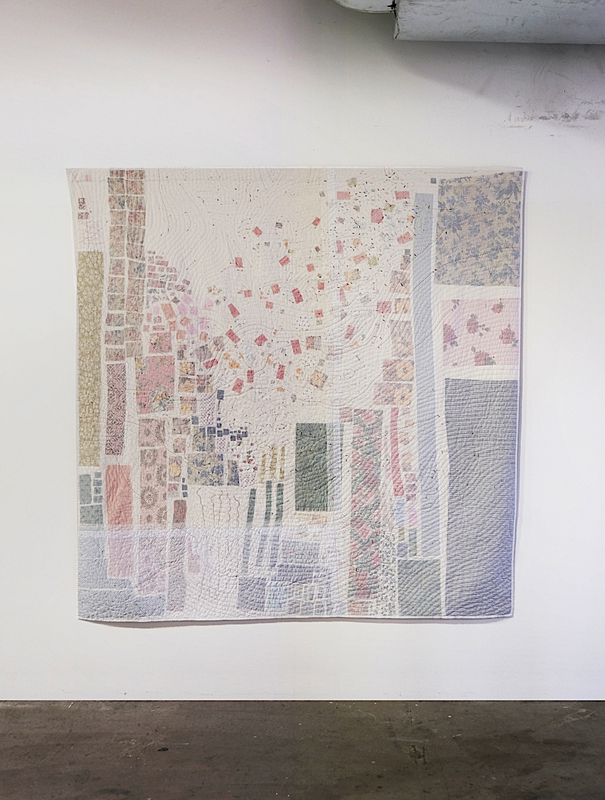 "TransHumance: a new HUMUS for textile identity” defines a contemporary expression of traditional material processes of the Apulia region in Italy, in order to achieve a transcultural comparison. 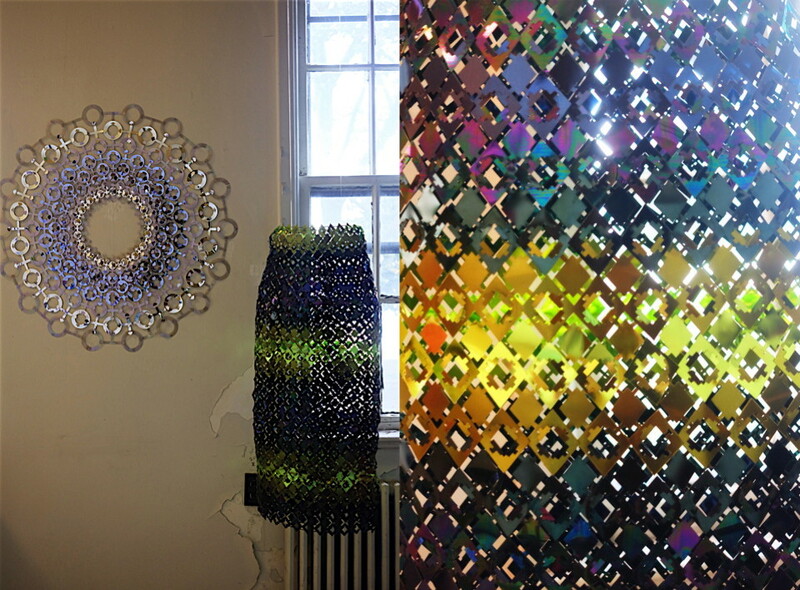 Their installation showcased the importance of the research process in newly developed fibres, materials and techniques. 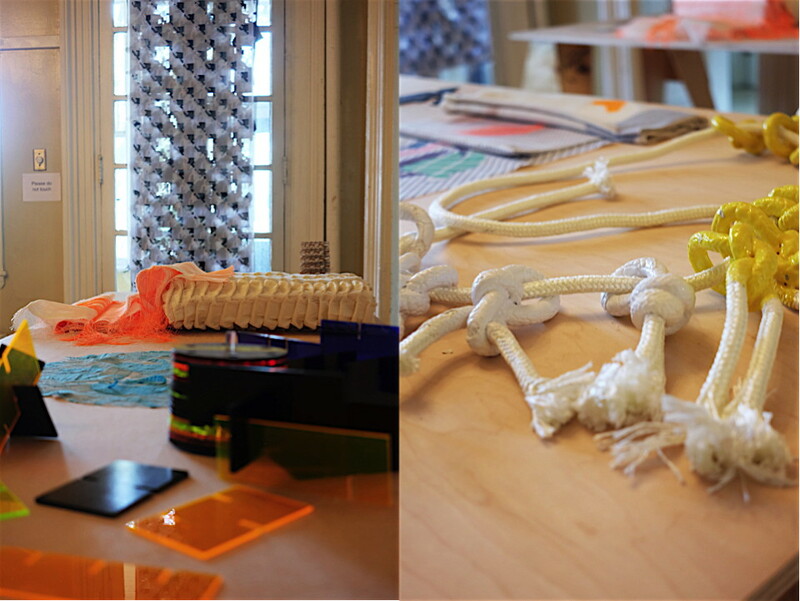 Also the London-based Royal College of Art focussed on new materialism, expanding the boarders of 3-D printing and advanced knitting. 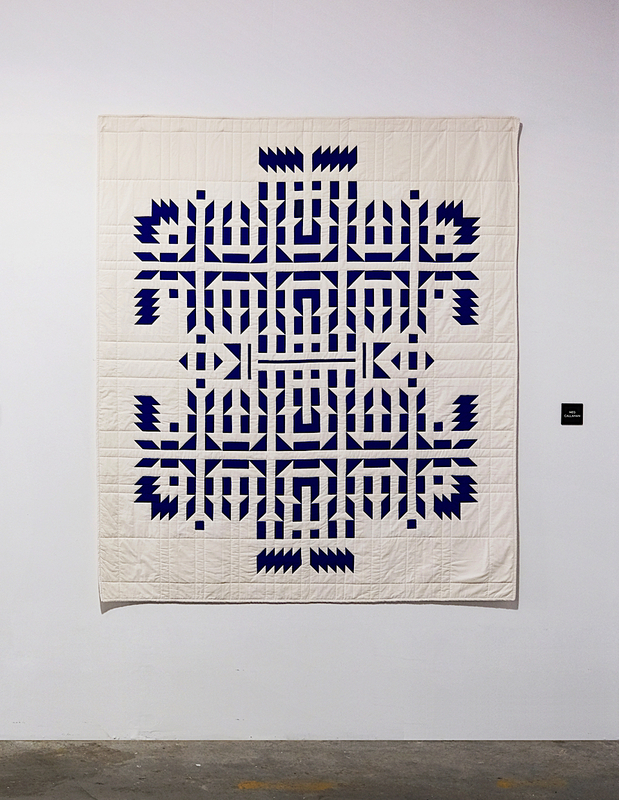 The Kent State University and the University of Massachusetts Dartmouth shared the top floor and used the characteristics of the colonial architecture in showcasing textile art in the broadest sense. 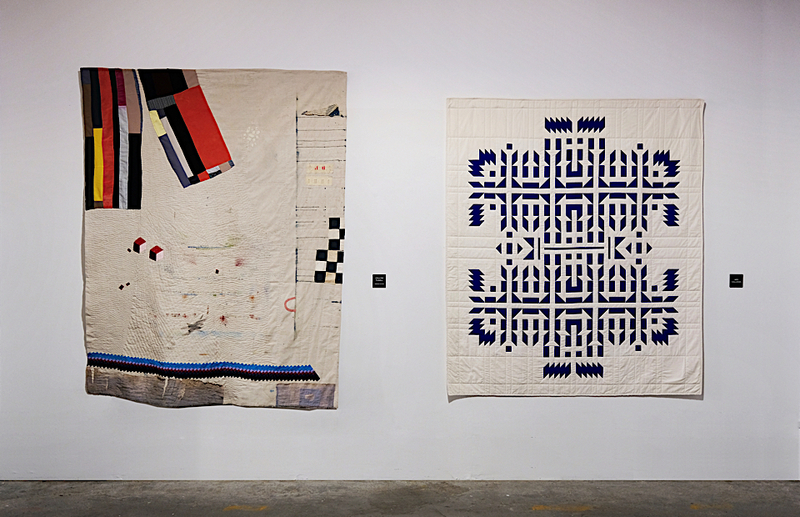 Textile work was used in the creation of paintings, sculptures and other artefacts. Parsons School of Design, Central Saint Martins, Kent State University, Royal College of Art, University of Massachusetts Dartmouth, Politecnico di Bari, Philadelphia University and Pratt Institute. 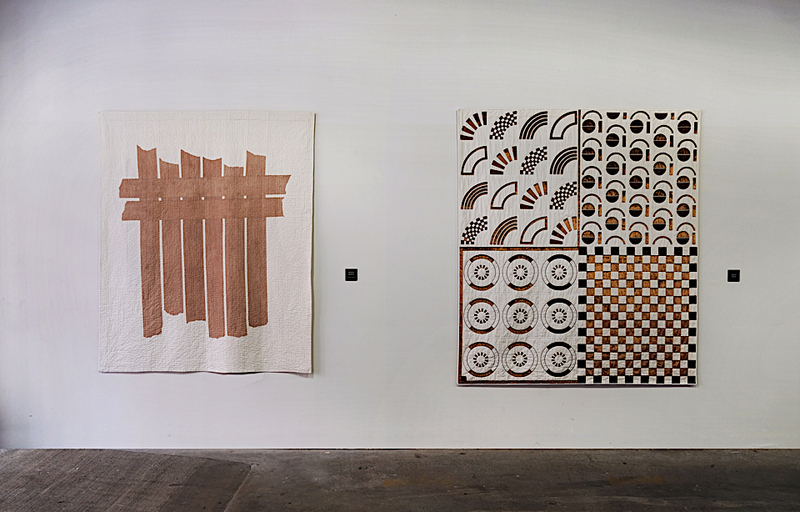 New York Textile Month is initiated by Li Edelkoort Dean of Hybrid Design Studies at The New School's Parsons School of Design and co-ordinated by Willem Schenk.